For the macaroni and cheese cook pasta according to package instructions in salted water. Drain and set aside. Melt butter over medium to medium-low heat in a skillet. Whisk in flour salt and pepper and cook 3-4 minutes stirring continuously. Pour in milk slowly and bring to a low boil. Stir constantly until sauce begins to thicken. Reduce heat to low. Add cheeses and Truffle Spread. Stir until cheese melts. Add pasta and stir to coat. Place in a greased casserole dish. To make the crumb topping combine the bread crumbs Parmesan cheese, butter and parsley. Stir until uniformly mixed. 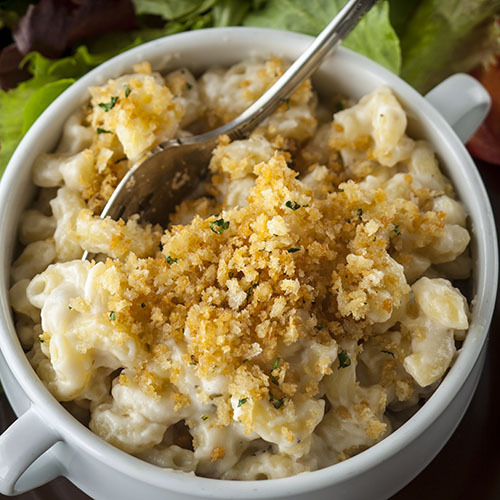 Sprinkle crumb topping over macaroni and cheese. Bake for 20 minutes or until the cheese bubbles and the crumbs are golden brown.